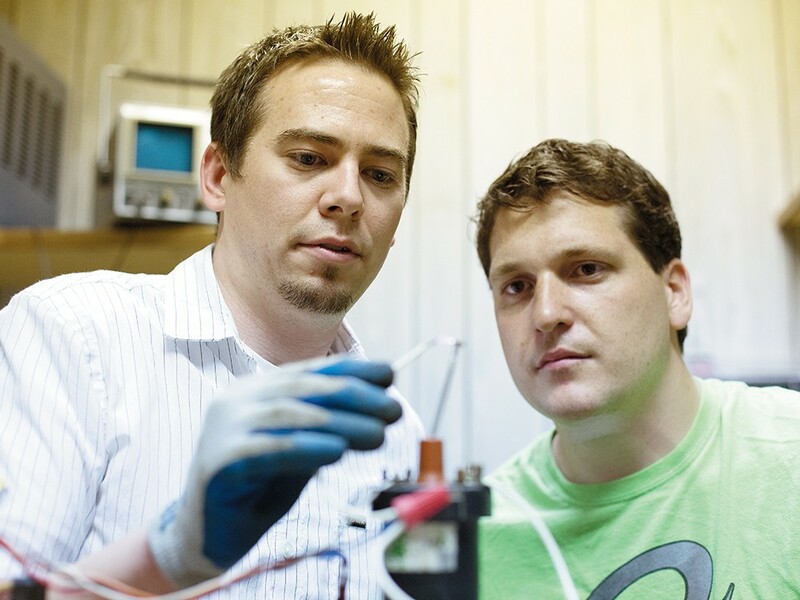 Nate Cutler (left) and Dan McGee work on a spark gap ignitor at Spokane Create! Beyond the Linux-based computer lab, windows into smaller rooms reveal computer towers in various states of disassembly, tables of soldering tools and tiny microcontrollers, loose cords and wrenches. Shelves hold beige printers and an old brown telephone, stored in the building for years before the current tenants moved in. On every surface, assorted bits of technology lays unveiled, dissected and reimagined. “You wouldn’t know it, but we’ve done a lot of cleaning and sorting and throwing stuff away,” says Nathan Cutler. “Yeah, this is about a thousand times better than it was when we started,” Dan McGee says. McGee and Cutler are board members, along with David Freiberger, of Spokane Create!, housed a few blocks off East Sprague Avenue in a low-profile building that trembles when trains rumble by on the neighboring tracks. Imagine a high-tech nerd clubhouse — then forget the glassy surfaces, rounded corners and high ceilings of an Apple Store. Forget The Matrix. Here, between these paneled wood-grain walls — “the beautiful wood grain,” McGee jokes — aesthetics matter less than potential. Here, everything is seen for what it could become: A boxy old printer becomes a treasure chest of motors and parts. A siren sitting atop a filing cabinet is a challenge to come up with a good use for it. In the next room, members are calibrating a 3D printer made of 3D-printed parts. “One of the things we always love is building things that build other things,” McGee says. Each Wednesday evening, members stop by to work on their own projects and see what other guys are working on — and so far it is pretty much guys, though wives and girlfriends often tag along. The word “play” gets used a lot. Don’t be intimidated by enthusiastic conversations about Arduinos and Raspberry Pi, CNC mills and step motors. These are nerds who want to teach you to nerd out with them. The idea for a space like this had been simmering online for some time when the group first got together the last weekend of January. Other cities have thriving community workshops — often called hackerspaces or makerspaces — grounded in the value of actual, physical places where people can collaborate and create actual, physical things. Most are tech-focused, but some have branched out into other types of making things, like sewing, cooking and more traditional art. A central idea is peer learning, which can mean classes and lectures or something much less formal. In Spokane, the word spread online through Reddit and Craigslist. The group started meeting regularly, but it was an exciting day in April when the owner of Banner Fuel said they were welcome to set up shop in the building that hadn’t been used recently for anything but storage. Once a month, the group holds a meeting for any business and some type of learning activity, and Wednesdays are always open for whatever projects people have in mind. A recent project made a front door lock that members can access through wireless to get into the building whenever they want. Other projects are more about seeing what’s possible. Alan Chatham, who’s been promoting interactive art through events like Art Up Weekend and his organization Laboratory, is a bridge between the group’s more technical side and Spokane’s artistic community. Right now, Cutler says, someone who wants to learn how to machine something or design a circuit board pretty much has to sign up for a college class. The hope is to get more tools and “cool stuff,” along with building a community of members who bring in new skills. “If we can get all these people with different backgrounds together, we can really learn from each other,” Cutler says. Anytime someone has knowledge others don’t becomes an opportunity for sharing. It’s a frustration McGee says he’s shared with others in the group, that learning new things isn’t a priority once you leave college. Find out more at spokanecreate.org.